Jose Oliva speaks to CBS Miami. He used the term five times in CBS Miami interview. House Speaker José Oliva turned heads nationwide when called pregnant women “body hosts.” The Miami Republican issued a public apology after his language was universally panned. 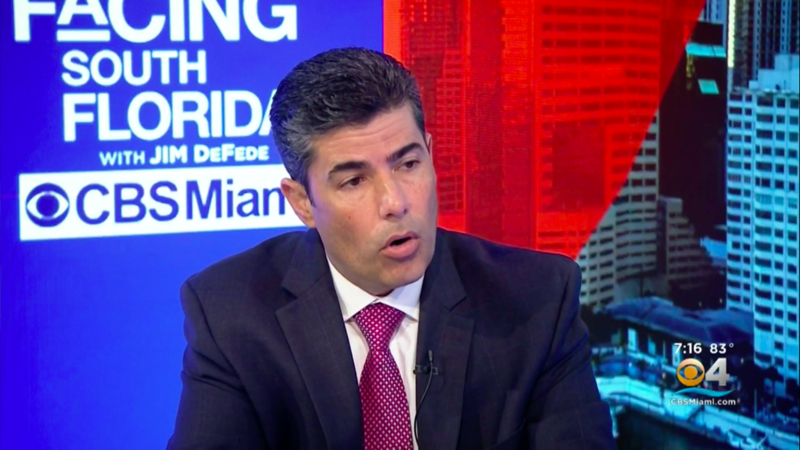 The Miami Republican used the term five times in an interview with CBS Miami where he supported a “cooling off period” before abortions. The pro-life politician said he used the phrase as a way to differentiate the life of an unborn child. “In a recent interview where the very controversial topic of abortion was raised, I used the term ‘host’ to describe a pregnant woman. It was an attempt to use terminology found in medical ethics writings with the purpose of keeping the discussion dispassionate,” he said. Indeed, the provocative term drew wide attention. Novelist Jane Caro called the remarks dehumanizing. Host body! No longer a complete and individual human, apparently, when a woman gets pregnant, just a host body for another human. Jesus wept. Florida Democrats quickly piled on criticism of the remarks. State Rep. Anna Eskamani, an Orlando Democrat and former Planned Parenthood senior director, called out the remark on Twitter. “With all due respect Mr. Speaker, my body is not a ‘host’ and personal medical decisions around my pregnancy belong to me, my family, my doctor, and my faith — not to politicians,” she said. Oliva in his statement following the outrage said he intended to use the phrase “host body” as a way to lower emotion but that clearly failed. And for House Democratic Leader Kionne McGhee, that apology felt sincere. Still, the “host” terminology became the sound bite cited everywhere. And other critics said the notion simply confused medical facts entirely. “Pregnant patients are autonomous people, not a ‘host body,’ “ wrote Dr. Daniel Grossman. He also linked to a University of California, San Francisco study that found women don’t change their minds about getting abortions regardless if they wait three days.